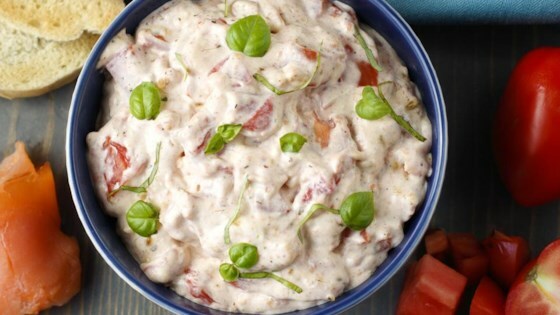 "You don't need airfare or a cruise line to enjoy this game day dip favorite! Packed with flaky smoked salmon, this appetizer comes together with a mayo-and-cream cheese base. Mix roasted tomatoes with lemon juice and McCormick® Chicken Bruschetta Seasoning Mix for a tangy, flavorful finish. Serve with baguette or crackers." Preheat oven to 425 degrees F. Mix tomatoes, oil and 1/2 package of the Seasoning Mix in large bowl. Place in single layer on large, shallow, foil-lined baking pan. Roast 25 minutes or until tomatoes are soft and browned on top. Let cool. Mix cooled tomatoes and lemon juice in large bowl. Add salmon, cream cheese, mayonnaise and remaining Seasoning Mix; gently stir until well blended. Garnish with basil. Serve with sliced baguette or crackers. This delicious, easy pasta dish with zesty herbs is bursting with flavor.